The arrival of Creedence Clearwater Revival’s 50th anniversary brings an unprecedented celebration of everything the band contributed in their short but startlingly epochal time together (1968 – 1972). Although the band members were together for only four years under the Creedence Clearwater Revival appellation, they managed to accomplish more than many artists do in a lifetime. Powered by John Fogerty’s visceral growl, along with Tom Fogerty, Stu Cook and Doug Clifford’s gritty, in-the-pocket punch, they’ve sold over 30 million records in the U.S. alone, releasing 14 Top 10 hits, six Platinum albums (two of which went to number one) and one Gold album. Over the last 50 years, Creedence Clearwater Revival’s canon has become a part of the Great American Songbook. Songs like “Bad Moon Rising,” “Down on the Corner,” “Fortunate Son,” “Have You Ever Seen the Rain?,” “Proud Mary,” “Born on the Bayou,” “Travelin’ Band” and “Up Around the Bend” have been ingrained into pop culture — not just as rock staples, but as classic standards. 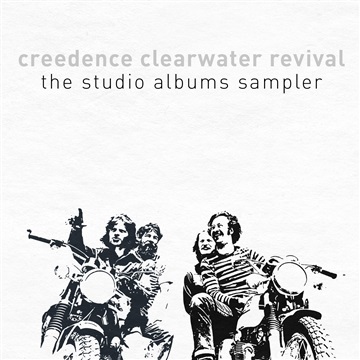 With so many memorable songs that continue to grace our radio waves and television and movie screens, plus lyrics that still resonate today, Creedence Clearwater Revival is, truly, America’s greatest rock ’n’ roll band. To commemorate this milestone anniversary, Craft Recordings has released a deluxe 7-LP box set (The Studio Albums Collection) comprising the band’s complete studio output. Each album in this collection has been mastered at half-speed at Abbey Road Studios, benefiting from an exacting process that allows for an exceptional level of sonic clarity and punch, bringing these classic recordings a new vibrancy. Also recently launched, is a new official short form audio visual project offering a fresh take on their timeless standard, “Have You Ever Seen The Rain.” Directed by Laurence Jacobs—the project features Jack Quaid (The Hunger Games, Logan Lucky, HBO’s Vinyl and Amazon’s upcoming The Boys), Sasha Frolova (FOX’s Red Sparrow, Netflix’s Snowpiercer, KENZO’s The Everything) and Erin Moriarty (Marvel’s Jessica Jones, Amazon’s The Boys).